Click Mark as Read or Mark as Unread. To mark several messages as either read or unread at once, click the first message, hold down Ctrl, click the other messages, and then select the option you want. Repeat to toggle a message status from read to unread and back again. Press Ctrl+Q to mark the message as read or Ctrl+U to mark it as unread. From the folder pane, select a folder (only one at a time). Click any message in the list of messages, and then press Ctrl+A to select everything in the folder. Select Mark as Read or Mark as Unread. If you want, you can slow down how quickly messages get marked as read. 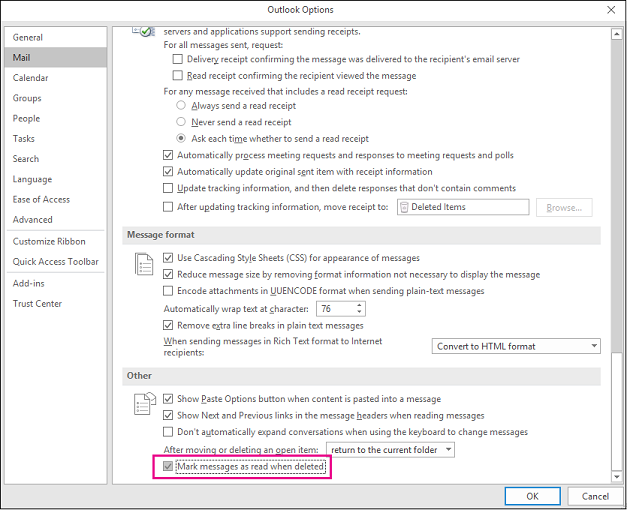 For example, after you select a message, Outlook can wait 30 seconds before marking it as read. Under Outlook panes, click Reading Pane. Select the Mark items as read when viewed in the Reading Pane check box. 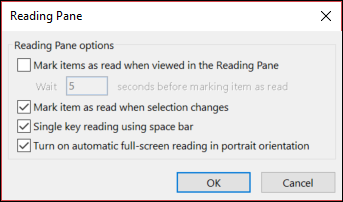 In the Wait n seconds before marking item as read box, type how many seconds you want to wait between when you click a message in the Reading Pane and it appears marked as read. Select File > Options > Advanced. Under Outlook panes, select Reading Pane. Uncheck the boxes for Mark items as read when viewed in the Reading Pane and Mark item as read when the selection changes. 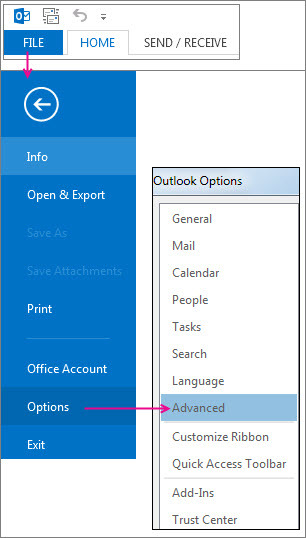 Click OK twice to return to Outlook. Important: This new option is currently only available for Office 365 ProPlus and Office 365 Business customers on the Monthly Channel who upgrade to Version 1803 (Build 9126.2116) or later. It is not available on versions. If your Deleted Items folder shows that you have unread items, there's now a quick fix to make sure all deleted messages are marked as read. Select File > Options > Mail. In the Other section, check Mark messages as read when deleted. Select the messages you want to change. To select adjacent items, click the first item, and then hold down SHIFT and click the last item. To select nonadjacent items, click the first item, and then hold down CTRL and click additional items. To select all items, on the Edit menu, click Select All. Note: Changing the view for items can make selecting specific items easier. For instance, if you want to select all messages that have the same subject, in the folder containing the messages, click View, point to Arrange By, and then click Conversation. Select the messages you want from the view. Select the Mark items as read when viewed in the Reading Pane check box, and then type a number in the Wait n seconds before marking item as read box.